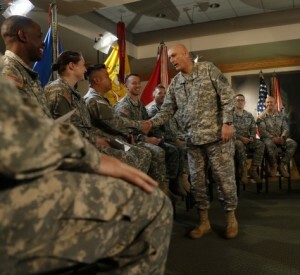 FORT HOOD, Texas (April 7, 2015) — Near- and long-term changes in Army force strength, retirement and compensation were heavy on the minds of the 22 Fort Hood Soldiers, who addressed Army Chief of Staff Gen. Ray Odierno during a virtual town hall held here, April 2. This was the fourth virtual town hall in which Odierno fielded questions, but the first conducted next to Soldiers. Odierno said he had been looking forward to the format change and hearing directly from Soldiers. Before fielding any questions, the chief clarified that changes are coming to the Army’s tattoo policy, and that the April 1 announcement was not a joke. Those changes will be published soon, Odierno said. For the next 45 minutes, the general answered questions from Fort Hood Soldiers and four others that were submitted via Twitter. Army Chief of Staff Gen. Ray Odierno greets 22 Soldiers before a virtual town hall on Fort Hood, Texas, April 2, 2015. Soldiers’ questions ranged from the future for new Soldiers to the revamp of the Army retirement system, from new uniforms to maintaining medical and child care benefits. Odierno said the questions he receives are similar throughout the Army, but he said when young Soldiers ask about retirement, it shows him they are looking at the Army long term. Several Soldiers asked the chief about changes to compensation and retirement plans, especially in light of the recommendations offered by the Military Compensation and Retirement Modernization Commission, or MCRMC. Odierno told Soldiers the one percent pay raises are temporary and will ease in the next two to three years, but can save $25 billion each year. Soldiers’ rate of pay has increased so rapidly that the cost of a Soldier has doubled since 2001, from $45,000 a year to $90,000. The force cannot sustain that level of growth, the chief said. Housing allowance increases are also slowing. The general said housing allowances are set based on community surveys and the Army is trying to break the cycle of rents matching those permitted allowances. “We are trying to stabilize the cost of housing,” he said. Odierno said that it is important to ensure Soldiers are compensated appropriately to keep the all-volunteer force, but that that compensation must be balanced with the size of the Army. “We’ve got to come up with that right balance,” Odierno said. The MCRMC recommendations of moving the Army’s retirement plan from the Thrift Savings Plan to a 401K prompted several questions at the town hall. Soldiers asked about the 401K proposal and the possibility of implementing a retirement plan briefing into the series of entry briefs. Noting that those serving would be grandfathered and given a choice about opting into the 401K, Odierno said any changes to retirement savings are a few years away. He said that “financial literacy” sessions online and through resource centers on installations are among the commission’s recommendations as well to help Soldiers make sound decisions about retirement planning. Of all of the commission’s recommendations, healthcare and retirement changes worry the chief the most. Odierno and the other service chiefs will submit their responses to the commission’s recommendations to the president and Congress. Odierno assured the Soldiers that they will not lose their child care, health care or retirement, but some plans might change. Soldiers and their Families will still have access to medical specialists and routine health care providers, but the system of delivery or coverage might change, he said. Soldiers who participated in the town hall were selected by their units and represented junior- and senior-enlisted troops and junior officers from across the installation. Many questions, especially from enlisted troops, dealt with promotion and advancement opportunities. One Soldier asked about the future for new Soldiers as the cuts continue and more are threatened. “The Army is going to be an enduring institution,” Odierno said, noting that despite the reductions over the past three years and the next three years until the Army stabilizes at 450,000, the Army still brings in 60,000 new Soldiers each year. With the new Army Operating Concept that will bring the force into the future and the opening of new positions to females, there are great opportunities in the Army, Odierno said. “The Army is becoming a place where more people are able to excel and really improve themselves,” he added. More positions continue to open up for female Soldiers. Odierno said that, along with Ranger School opening, female troops are being integrated into combat military occupational specialties, or MOSs. The chief’s decision on armor and infantry being integrated is due in October, and testing is still underway. He noted that he would have to demonstrate why any exemptions should be made to prevent women into an MOS. If he does not make any recommendations, everything will be open as of Jan. 1, 2016, he added. Sgt. 1st Class Armin Englerth, a battalion-level sexual harassment/assault response and prevention advocate in the 85th Civil Affairs Brigade, asked the chief’s thoughts about removing a commander’s authority over a sexual assault cases. Odierno said he disagreed with removing a commander’s authority and noted the military’s higher-than-society prosecution rate and stiffer punishments. Englerth said he appreciated the opportunity to participate in the town hall and was also interested to hear the chief’s responses to questions about reductions in personnel strength and the ongoing conflicts in the Middle East. Englerth is watching the changes closely and plans to stay in the Army. Englerth said participating in the town hall was interesting, and he was happy to be sitting among those asking the questions. Odierno was happy to be where he was. After the session, Odierno addressed potential sequestration cuts and their affects, especially at Fort Hood, where cuts to personnel could top 16,000. That capability offered by Fort Hood units is especially important as rotations continue to Europe, Kuwait and Korea, he said. The town hall is available in its entirety online at www.dvidshub.net/video/397258/csa-virtual-town-hall#.VSLzyfBgjKE or on YouTube at www.youtube.com/watch?v=v-rpfB-ypMQ.